It’s easy to put Abraham and Sarah on a pedestal—after all God did call Abraham to be the father of His chosen people. Yet, it was God who set them apart from others. At their core—Abraham and Sarah were regular people with whom God chose to do incredible things. But lest we become too critical of Abram, Sarah too looked to what seemed logical at the time—the only way that it seemed to her she could bear this promised child was to give her servant Hagar to her husband. So she did. To be honest, these two people approached life in the same way as I most readily do—by what seems logical within the time they lived. Abraham and Sarah approached the difficulties of life through their cultural lens and answers of their time. It comes far to easy for me to take action within what seems to make sense to me—in the here and now—the 21st Century American woman. I wish I looked with those eyes most often. It is so true, so universal. No matter how hard we try to be perfect spouses, parents, parishioners, brokenness will come. We can no more escape the pain of our world any more than we can jump over the moon. The pain for some seems and is harsher than others, but great or small it is there—pushing us into Jesus. Those five testimonies were so different, yet the thread that ran throughout each one is that in the midst of brokenness, Jesus came. He sought them out, even when some were not looking, to bring healing, peace, and life. Sometimes we look so good on the outside that people don’t realize that each of us needed a Savior. Sometimes in the moments of goodness, it’s easy to forget just how lost we were. Then sometimes, in the hard times, it’s easy to forget that we are broken no more. Perfect? …not here, but there is much to be grateful for. 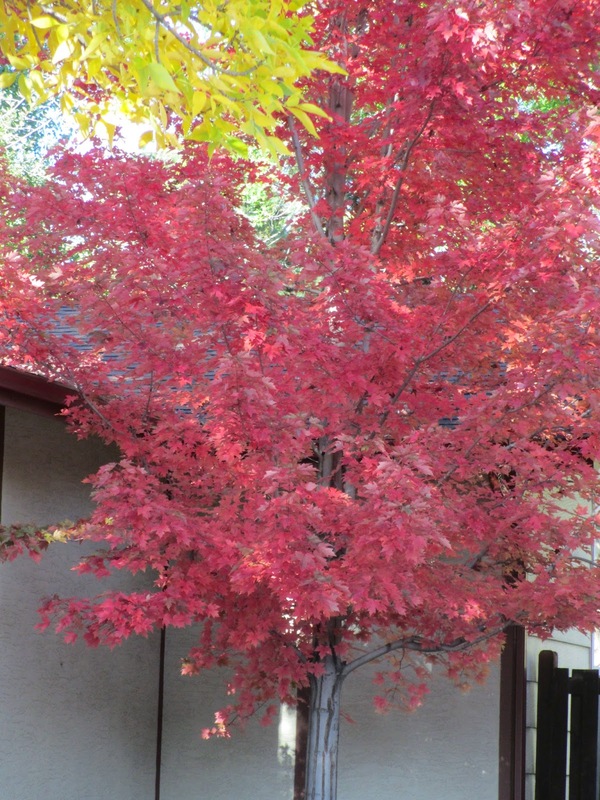 Our neighbor across the street has a tree with blazing autumn red leaves, so rare among all the Colorado yellows. It reminds me of my Midwestern roots and the beauty of fall that leads into Thanksgiving. My childhood Thanksgivings were spent among grandparents, aunts, uncles, cousins. It was the holiday I missed most when I went to college. Today these autumn leaves remind me of Thanksgiving—that I am whole and I should be characterized by gratefulness. Pack in the beauty that autumn brings like storing up can goods for winter. Breathe in clear air that’s not too hot and not too cold. I want to fill my heart with gratefulness, for winter days are just ahead.